When the Three Gorges Dam is completed in 2009, it will be the world’s largest, but its reservoir will also submerge many villages and displace thousands of residents. Preserved in verse by the poet Li Bai, Fengjie in Chongqing is one of these unfortunate villages. Since the water began to rise in January 2002, the villagers’ lives have revolved around the issue of migration. The troubles and strengths of these villagers, gripped by anxiety toward the future, surface as the spectacle of migration begins. Poignantly capturing the transition of an era, the film leaves a beautiful echo that resonates with the flow of time yet to be sung. [Director’s Statement] Before we went there, many of my friends told us, We want you to film the beauty of Fengjie, “the capital of poetry”—because famed poets Du Fu and Li Bai wrote their poems about its beauty. They said, We want you to film the magnificence of the Three Gorges—because it is a poem of Nature. And then, We want you to film the simple people of the Three Gorges, people full of life, and the boatmen whose shouts are like songs—because that is the essence of poetry. Our reply? Of course! Why? Because art itself is poetry. But, what kind of poem captures the tears of an old man, and depicts the life of a gang of miserable coolies who live like dogs? In the ruins of the town, all people talked about was one thing, a house. A house above anything, above all things. Unable to find poetic beauty, we went to a church; in a church, we would find songs, poetry being sung. How were we to know that even there, every song that was sung to the letter was for a house. Poverty, unemployment, the loss of individual rights, the privation of the principles of justice, irrationality, utilitarian values—but life has to go on. The truth we had to face was the fear growing in our hearts. What our camera saw in that whirlpool of fear was human dignity drowning in the ruins before the flood. After on location shooting, we went back to Chongqing for post-production editing. Our friends asked us, How was it there? Were you able to capture the sentiment of poetry? We said, No! They asked, Why? Why not? We were in a bad mood and answered, From now on, we are enemies of all poetry! Born 1966 in Chongqing, China, Li Yifan graduated from the Central Academy of Drama in Beijing in 1991, and afterwards worked as a director for TV commercials in Guangzhou. In 1996 he returned to his hometown and worked as a writer. Between 2000 and 2001 he worked as the chief editor of the newspaper Yu Zhou Fuwu Bao. 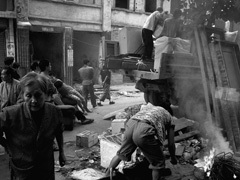 Born 1971 in Chongqing, China, Yan Yu launched his career as a photojournalist with Chongqing TV Station where he worked between 1994 and 1998. He moved to Beijing later to become a private photographer for documentaries, series dramas and advertisements. Li Yifan and Yan Yu established Fan Yu Productions together in 2001.